Vielen Dank für das schöne Freebie. Thanks for this beautiful design. le printemps en hiver c'est top !! Moc děkuji za krásné výšivky. Very pretty thank you so much. Dank u. Beste wensen voor 2016! These labels are lovely. Thanks so much. 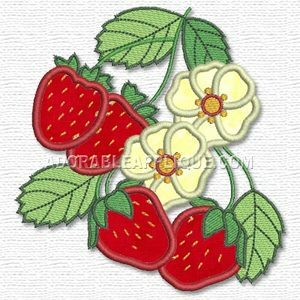 I love the fruit appliques. Thank you for another wonderful design, I am loving all the fruits so far. thank you, thank you for the strawberries. they look so real. Very nice! Thank you for your awesome generosity!! Thank you for the lovely fruits! I love strawberries, thank you! Stunning design!! !Thank you very much!! !